September 2016 Horoscope for Aries zodiac sign shows that most of the planets are moving to the upper half of the horoscope towards the mid heaven sign. You should be ready to shift your attention from home and emotional issues to personal ambitions and outer goals. The emotional strength you have achieved earlier will be of immense help in attaining your personal targets. In September 2016, planetary strength for the Arians will be very powerful in the Western sector of your natal chart in the 7th house of love and marriage. Hence social activities and interests of other people will dominate over independence and free will. With the shift of planet Mars into the 7th House, your self-esteem will reach its peak this month. 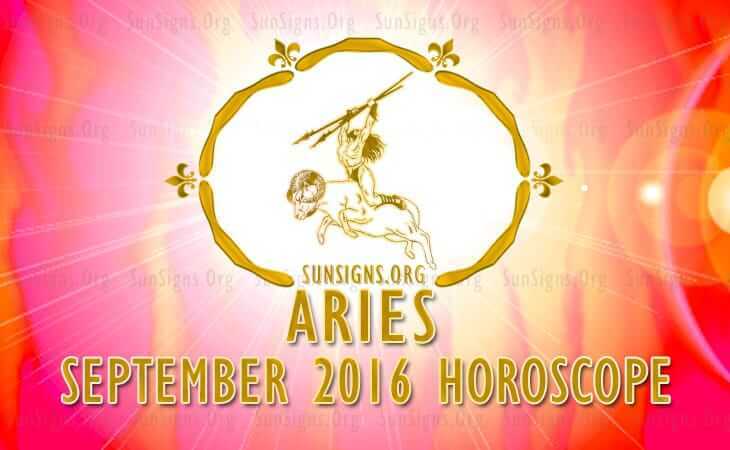 The Aries 2016 September monthly predictions suggest that the office environment will be conducive for progress. You have to put in more effort to achieve your targets at the work place. Business travel and advanced training to improve your professional expertise are indicated. Aries personalities looking for jobs will get very good opportunities. Changes in the job description in the present organization are expected and there may be a change of job to another company for the Rams. September 2016 will be a fabulous month for the Aries financial earnings. Professional sources will be the main source, while risky ventures may yield good returns. Investments in precious metals, gaming and services sector will provide sound opportunities. Expenses require monitoring after the first week. The Aries astrology forecasts for September 2016 show that your prospects of love are wonderful and may result in marriage in future. Single Arians will have plenty of opportunities for forming love partnerships. You may find love overseas and with foreign partners. Religious places and academic centres will be another source for dating and romance. Usual scenarios like social groups and parties are where you might find your true soul mate. While Jupiter ensures love opportunities, Mars will make you more forceful in love. You will be chasing love relentlessly when somebody catches your attention. There will be strong sexual desires which might culminate in pregnancy. The September 2016 horoscopes suggest that health for the April born will be wonderful this month. You might have some fitness issues towards the end. You are aware of health issues and your prompt attention to take care of minor ailments with home remedies will help you to maintain your well-being. Be it a common cold or muscle cramps, do not take anything easily. Conflicts in love partnerships may induce mental health problems. This can be remedied by making serious efforts to eliminate disharmony in relationships. Check out your daily biorhythms to know more. To conclude, passion, aggression and chasing your dreams are the key notes from the September 2016 Aries horoscope.